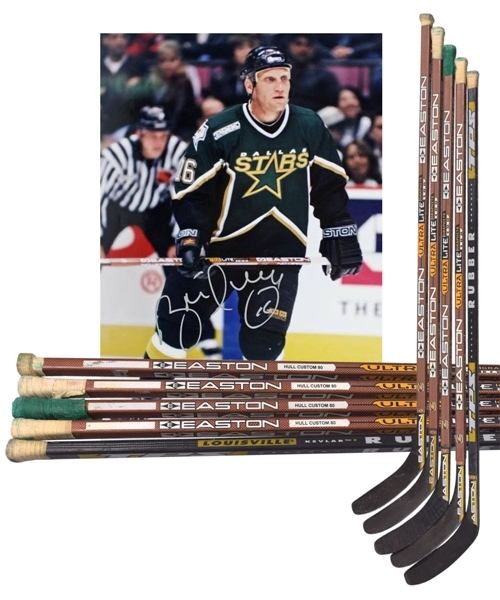 Originating from his time in The Lone Star State, Brett Hull would dress for Dallas for three seasons in the late-1990s/early-2000s, helping lead the club to 1st place finishes in the Pacific Division in each season, along with a Stanley Cup victory in 1999. We have a collection of 5 sticks that all saw action in Brett’s hands during his time with the Stars. With four matching Easton models along with a single Louisville example, the Easton sticks (circa 1999-00) all have Hull factory graphics over the upper shafts, with each retaining the original tape over the handles (four different variations), with just a single stick sporting the tape over the blade. A signed LOA from Brett Hull will accompany. The Louisville stick (circa 2000-01) feature’s the intact black tape over the inserted Easton blade and white tape over the knob, with “1/15” handwritten over the upper shaft. The Easton sticks all show varying degrees of use, with a heavy stickum-like product coating the shafts, making each extremely sticky to the touch.